In 2002, Gary Mullen and the Works formed to pay tribute to rock legends Queen. Gary Mullen and the Works have performed throughout the UK, USA, Europe, South Africa and New Zealand to sell-out audiences. The outfit has also twice rocked the prestigious BBC Proms in the Park, in front of a very enthusiastic crowd of 40,000. 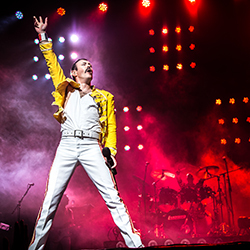 One Night of Queen is a spectacular live concert, recreating the look, sound, pomp and showmanship of arguably the greatest rock band of all time. This show will ROCK you!